Although hospital beds are often associated with exclusive use within hospitals, they do have many other applications outside the hospital environment for those who are chronically or even terminally ill.
Hospital beds in homes are essential to the comfort and stable condition of many who are confined to their beds. Whether used within a private dwelling or within sheltered or residential accommodation, hospital beds can prove to be invaluable to those confined to them and offer considerable advantages over standard beds. It is essential for either the individual themselves or those responsible for their care to choose an appropriate bed carefully which will enhance the comfort and stability of the individual. When choosing hospital beds in homes there are a number of considerations which should be suitable thought through. However, the primary concerns will often come down to the levels of patient comfort which the bed can provide and the initial cost of the bed. For use in the home there are two types of bed that would generally prove to be suitable; either the gatch bed or the electric bed. The gatch bed is a manually operated bed which requires the assistance of a carer or a medical professional for it to be adjusted as this cannot be done by the patient themselves. The key advantage over the electric bed is the price as the gatch bed is considerably cheaper due to its much reduced level of complexity. 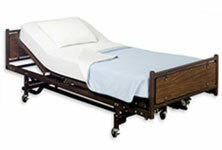 The electric bed however has the potential to offer much greater levels of patient comfort. It does not require the assistance of a carer in order to be operated as all of its functions are controlled by an electronic control panel which can be used by the patient. Furthermore, the electric bed offers a greater range of adjustments that can be made and with greater precision than any other hospital beds in homes. Although it is considerably more expensive than the gatch bed it is worth the investment for those who are confined to a bed in the long term. The way in which hospital beds in homes are acquired is largely down to the financial circumstances of the individual. Individuals are generally presented with two options when seeking to acquire a hospital bed; to buy or to rent. If choosing to buy a hospital bed then the individual must choose whether to buy a new bed or whether to buy a second hand bed. Although, more expensive in the short term it is advantageous to buy a hospital bed rather than to rent so that the individual receives a tangible asset for the investment which can be sold when it is no longer required. Renting sees no return for all of the money that is invested in hospital beds in homes. Moreover, buying a new hospital bed can prove to be extremely expensive, whereas buying a second hand bed can prove to be much more realistic.